That arranged business was signing 19-year-old Paolo Franzoso from Palermo for his minimum fee release clause of £2.2m. Luiz Phellype has been overtaken in the pecking order, so much so that I was happy to look for replacements for him. My newly hired in the summer Italian scout alerted me to the 6’7″ forward and I jumped at what I thought was a cheap deal for a very promising player that’ll give us a different dimension up top. The month kicked off with a classic Classico Vitoriano. A heart stopping, back and forward, slobber knocker of a match in which we somehow came away with a 4-3 win despite conceding a penalty, missing one of our own, scoring straight from the corner after the save, Toni Borevkovic scoring three but one being a shocking own goal, Setúbal scoring two of their three of their shots on target, VAR taking away a brilliant 90th minute goal before Geelmuyden scored a dramatic winner in 90+5. These words nor a screenshot would tell the whole story. That drama was followed up by a calm and comfortable 4-0 thumping of Boavista away from home. Edgar Branco was on top form, scoring, assisting and earning man of the match. I’ve offered him a new deal that will get rid of his ridiculously low £2.2m release clause however even the £6.5m one locked in by his agent this time is ridiculously low. Now for the unthinkable. We needed a win at home against Spurs on the last matchday of the Champions League and were relying on PSG to do us a favour against Schalke. Grønli put us ahead early on thanks to a lovely counter corner break, the first one I can remember scoring on FM19 so far. Lucas Moura deservedly equalised for them before a beautiful Lovro Majer pass found Joveljic to coolly slot past Lloris. It was 2-1 at the break and 2-1 at full time after a strong second half performance in which Spurs barely created anything of note. We’d done our job, Europa League here we co… no. Serge Gnabry scored an 87th minute winner to give Schalke a 1-0 victory against PSG. I knew it’d be tough, but I’m not happy at going out like that. Geelmuyden is really starting to remind me of another Norwegian super sub/baby-faced assassin. He came off the bench to score another and get us a narrow win over struggling Nacional. That goal and another two against Academica to take us through in the Taca de Portugal takes his minutes per goal ratio to one every 45 minutes so far this season. Cracking form. We’re trying to claw our way into the title race but Porto, Benfica and Sporting just keep on winning too. 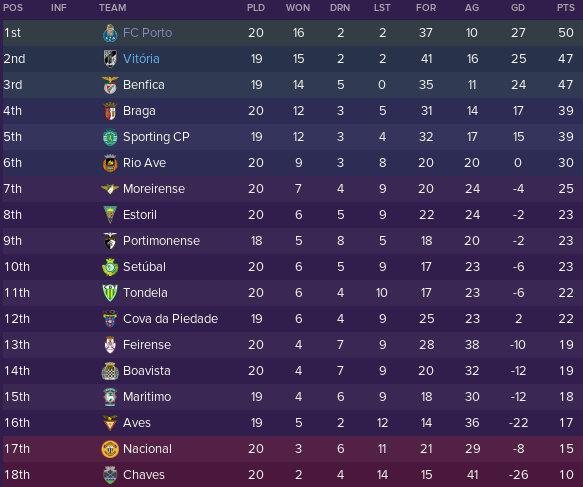 Comfortable 2-0 wins over Rio Ave and Braga in the Minhoto derby see us jump up to 3rd but Sporting have a game in hand on us to jump above us again. However, if we win our game in hand over Benfica and Porto, we’ll all be on 40 points with Sporting looking like they’ve got the upper hand right now. It’s tight! Look at all those greens this month. Another comfortable win against Nacional sees us safely through to the Taca da Liga semi final where we’ll face Porto to fight it out for a place in the final. I’m delighted to have signed a new deal that keeps me contracted to the end of season seven. Hope I get there. The bells hadn’t even stopped chiming yet to bring in 2022 and Spurs had fired in an offer for captain and starting left back, Rafa Soares. It was an attractive opening offer of around £20m, which I worked up to a potential £28m with 25% of the next sale and off he goes. It’s a new record sale and takes the total made this season from sales to £71m. He was subbed off to a heroes farewell as he helped us inflict Sporting’s first defeat of the league season which strengthens our position near the top of the table. 19-year-old Edgar Branco is more than ready to be our first choice left back now but I need some competition for him with no younger prospects ready to come through yet in my opinion. A deal was sealed for Rúben Canedo to spend the remainder of the season on loan with us from Porto as a temporary solution because I also secured the £5.75m signing of Josko Gvardiol from Dinamo Zagreb. The 19-year-old Croat is someone I’ve been tracking for a few seasons now and looks very promising. He joins the club now but is unable to play because he’s already appeared for both Dinamo and Eibar this season. The arrival of young Franzoso saw the end of Luiz Phellype’s time at the club after just 13 goals in two and a half seasons. He joins Gimnastic for £725k after arriving on a free. Toni Borevkovic is one of our key men in both boxes. The big central defender isn’t someone I want to lose, he’s improved massively in his time at the club so far and has formed a great partnership with Teodoro Paredes at the back. PSV and Stuttgart have put in a few bids of around £7m which would be a good profit on his £400k arrival but I’m not ready to say goodbye just yet. Vítor García also attracted a fair bit of interest from Milan on Italian deadline day but all six of the bids they made were rejected. Back to match action and Franzoso had an instant impact on his debut. We were dominating Portimonense in the Taca de Portugal 6th round but were struggling to grab the winner we deserved. Reisinho had equalised before all 6’7″ of the 19-year-old Italian rose highest in the box to power home a header and take us through to another semi final. We’ve been very lucky not to have suffered any major injury crises in my time so far at the club but in the space of a week both Grønli and Murillo were ruled out for a month with twisted ankles. Not quite a crisis but that meant they’d miss our next match, away in Lisbon against Sporting. Strangely the fixture list has thrown our two league matches against them back-to-back. We had to work hard for the points in this one, being 2-1 with 20 minutes left. A little tactical tweak to try and get the wide men into play a bit more going forward paid off. That win takes us six clear of them now and keeping pace with Porto and Benfica at the top. Celis and García joined the injury list as they both got the flu ahead of our clash with Porto in the semi final of the Taca da Liga. Could we reach the final again for the second year running despite four of our key players being out? Yes, yes we could. Joveljic put us ahead with a lovely finish after a great ball over the top from Mário Ferreira but Porto equalised early in the second half, countering us from a throw in deep in their half. Provider then turned scorer as Ferreira finished at the back post after a scrappy bit of play. That was enough to see us through to face Benfica in the final just days later. Could we now go on to retain the trophy? It wasn’t a classic but we managed to sneak it 1-0. On the overall balance of play we deserved the win but it took a set piece to make the breakthrough. Thaciano finishing after Borevkovic’ header was parried by their ‘keeper. We hit the woodwork three times over the course of the match so the result could have been much more comfortable, Benfica hardly troubled us even with a number of our first team players missing. Three days later we’d face them again, this time in the league. It’s 3rd v 2nd and we’re tied on 43 points. Porto are four points ahead of us at this stage but have played two games more. We’re unable to keep our winning run going but do keep our unbeaten run intact. A Palacios screamer cancelled out Joveljic’ opener. Just days later Palacios would be poached away by Liverpool for £35m. Thaciano celebrated a new four year deal by leading us to a win against Cova de Piedade with a brilliant hattrick from Mez(S) and that rounds off this portion of the season. I’m delighted to get through it in the way that we have. January was tough on the legs, I’ve got a lot of injured or tired players in the squad so I’ll definitely take where we are and how we performed throughout those matches. Here’s how the league table looks going into the home stretch. We’re in the title race again with a game in hand to go level on points at the top with Porto, with Benfica in the same situation. Sporting were unbeaten going into January but have fallen away with four defeats in five league matches this month, including two against us. Our January form led to another Manager of the Month award, two in a row now. We got through January without losing any more of our talents as the transfer window did it’s ceremonial slamming shut. The Rafa Soares sale hurt but it couldn’t be refused. I don’t feel the need to go out and splash our transfer budget because the B team talents are flying in LigaPro again so they’ll be a few of them ready to step up next season. 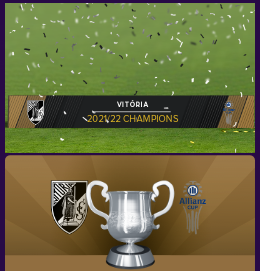 We retained the Taca da Liga to win the fourth trophy of my time at the club so far. Could we go on to retain the Taca de Portugal too this season? Would we, whisper it, win the league for the first time! ?